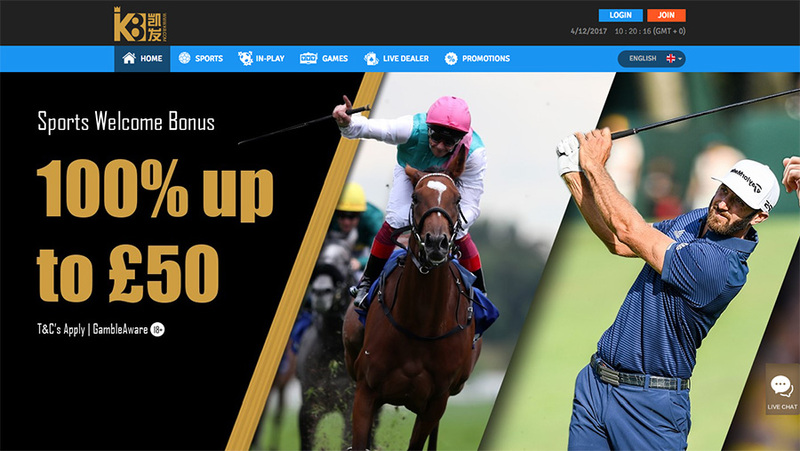 The K8 Sports Book is an online bookmakers that has been around for several years in Asia, but in 2015 expanded to explore European markets. The company behind this sports book began life in Manila, in the Philippines, but has now expanded globally to include office in the United Kingdom. As part of its expansion, K8 has operated sponsorship deals with EPL sides West Bromwich Albion, Manchester City and Schalke 04 in Germany, it even hired German legend Michael Ballack as a brand ambassador. The UK version of the K8 sports book is licensed by the United Kingdom Gambling Commission. There's a promotion here especially designed for sports betting fans. It's a one hundred percent welcome bonus up to a maximum of £50. This offer is open to new customers only, and the minimum you need to deposit in order to claim your bonus is £10. You may deposit just as much as you like for your welcome bonus but the maximum in bonus funds you can obtain is £50. Your sports bonus only lasts for fourteen days, but you can split your bonus up and use it for multiple events. Before you can withdraw funds you need to wager your bonus amount six times over in total. Only wagers on events with prices equal to or higher than Evens will count towards your wagering. Wagers on events with higher odds than 1,000-1 will not count either. This welcome offer is only open to people resident in the United Kingdom. The only other promotion that K8 offers is one that you can use in their attached casino room. This is a one hundred percent casino offer up to a maximum of £100. 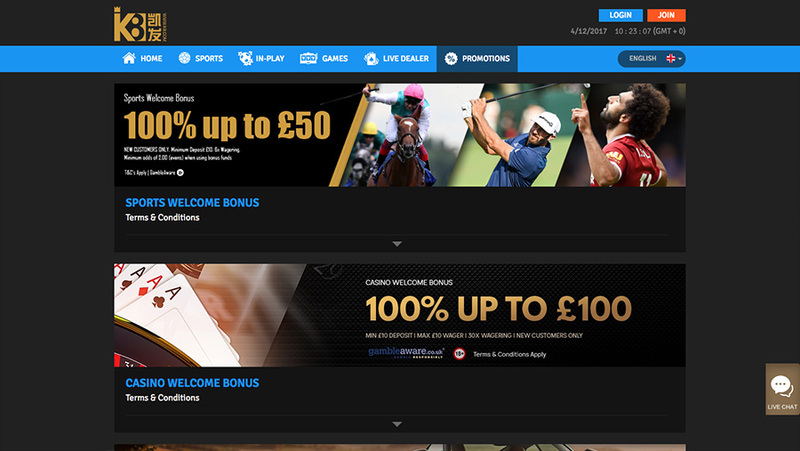 The minimum you need to deposit in order to secure this bonus is £10, and the deal comes with thirty times wagering before you can cash out. There's a loyalty scheme too at K8, but sadly this only (currently) extends to the casino side of things. You earn FPPs (frequent player points) on all games at the site, and you can exchange every one hundred FPPs you earn for €1. Live, in-play betting and cash-out are available at all times. The K8 sports book has been designed to be made to be used as easily as possible. The menus for all the leading markets are on the left hand side of the screen, but in the centre there's a really handy feature – links to all the sporting events available in the very near future. You can scroll through events happening in the next four hours, eight hours, twelve hours and so on. 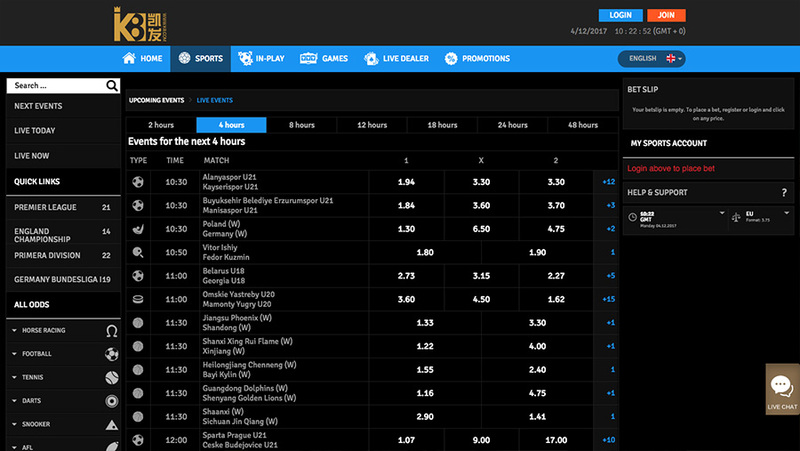 It's a neat way of betting if you prefer to bet in real time, picking up the best prices for numerous events. Access to the site's games is via the same portal, including the live dealer games baccarat, blackjack and roulette. The K8 sports book will accept most credit and debit cards, and will definitely accept any card that bears the 'Visa' or 'MasterCard' logo. Any deposit you make must be for at least £10, and there are no fees. There's no limit to the amount you can deposit, but you can set your own limits if you feel you are spending too much on your sports betting activities. Deposits are processed instantly, and you can also deposit from Neteller. You can make withdrawals to any payment method that you've previously made a deposit from. Again, there are no fees for you to have to worry about. You withdrawal should take around forty-eight hours to process, after which it will take anything from one to five days for your payments provider to process your request. We have discovered a very nice sports book here, and K8 have shown their commitment to European markets with their sponsorship of many leading football teams. It's not just football here, though as you can bet on almost every sporting market you could possibly imagine. There's a tasty welcome bonus too to get you started here in the best way possible. Guess we can chalk up the K8 sports book as another fine place at which to indulge in some sports wagering.